Does it get any better than this? Running across the top of Rocky Mountain. DEFINING CHARACTERISTICS: Mostly well-made trail but with some steep, slightly rougher sections. BEST MAP/S: Pick up a brochure at DOC Wanaka. Or there’s a good map on an information board at the car park – take a photo on your phone and carry with you. The run starts with a short, fairly steep uphill section on a gravel access road. At the top of the hill turn left on to single track to skirt Diamond Lake. Ignore the round-the-lake track for the moment and instead continue up hill to the viewing platform from which the first of many great vistas open up. Continue uphill past the platform and take the first left turn towards Rocky Mountain. The trail continues uphill winding through bush, under a bluff and then out on to open country. More great views now open up. At the next junction take the left-hand trail signposted to Rocky Mountain via western track. 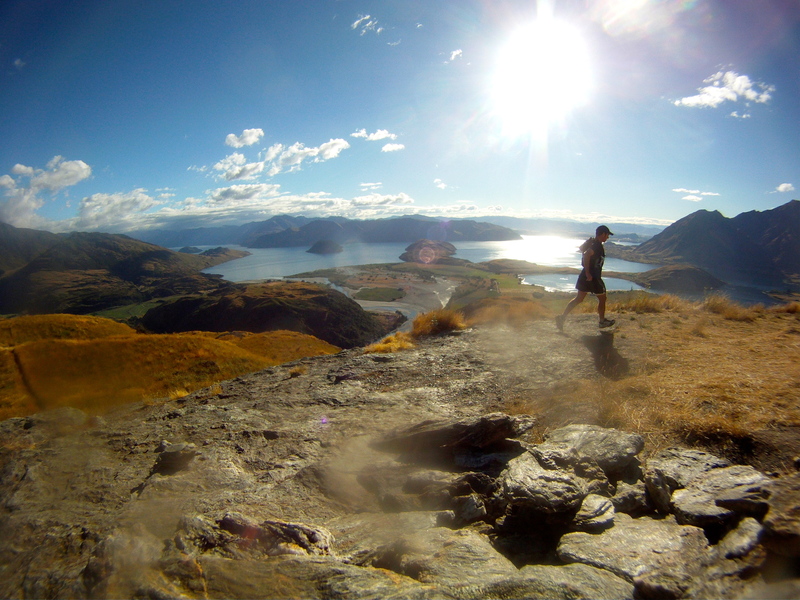 This leads you to the top of this unimaginatively named summit and panoramic views over Lake Wanaka and up the Matukituki Valley to Mt. Aspiring in the distance. Leave the summit on the northern side following the track downhill as it winds back on itself under the summit. Within a kilometre you’ll come to another junction where you turn right to once again head towards Rocky Mountain via the western track. A couple of hundred metres along here you will complete the upper loop and start re-tracing your earlier steps towards the summit for a second time – it’s well worth a second look! Once again leave the summit via the trail to the north and continue to the first junction. Last time round you turned right here, but this time bear left and follow the trail downhill. At the next junction turn left for a very worthwhile short out-and-back to the Lake Wanaka Viewpoint. Having drunk in more spectacular views re-trace your steps and continue on downhill until you reach the lake again. As soon as you hit the bottom of the hill turn sharp left to do a quick loop of this small but sparkling body of water and follow the gravel road back to the car park. POST RUN GOODNESS: Wanaka has a great selection of cafes, bars and restaurants for a post-run treat. A firm favourite is Ritual Café on Helwick Street, which has the world’s best carrot cake. Or for friendly service, great lake views and good quality fare try Kai Whakapai on the lakefront. To view this trail guide as a printable PDF file click here. Thanks for the recommendation Mal, this was a great track to run when we had a bit of spare time. The views truly are spectacular. They must be even more amazing in winter when there’s more snow around… I guess I’ll just have to come back again! Post-run goodness for us was a drive up to the end of Mt Aspiring road (couldn’t not do that! ), then back to the motel for a shower, and out to the Wanaka Ale House for dinner. They do awesome burgers with an entire main (not just a “side”) of fries!